When the question of defining social media indexing and Google Search Engine Result Pages (or SERPs for short) is raised, most people would be forgiven for scratching their heads. I can’t imagine SERPs are a topic that’s readily discussed at dinner parties or at the office water cooler; however the relationship between SEO and social media is one that a good digital agency should understand. Content marketing is about educating and entertaining an audience; social media is about promoting your content; SEO is about planting a flag on the digital landscape so that you can be found by those that are looking. Did you know that Google uses Twitter to find new content? The digital landscape is a continually-growing treasure trove of information. As of autumn 2015 it’s estimated that there are 936,395,700 websites – a number that’s increasing by the second. What Google does is gather information on the content of each page and index that page accordingly into Search Engine Result Pages so users can find it. In February 2015, Google announced that they’d struck a deal with Twitter to make indexing of the tweets visible the instant that they’re posted. Twitter can cut the amount of time it takes Google to find your content. The number of retweets by individual and different Twitter users, and the amount of time between tweets are taken into account when Google indexes your content. The faster your content is indexed, the more likely you are to enjoy a good organic ranking. This is why the consistent stream of content, created by Twitter users can play such an important role in content ranking. 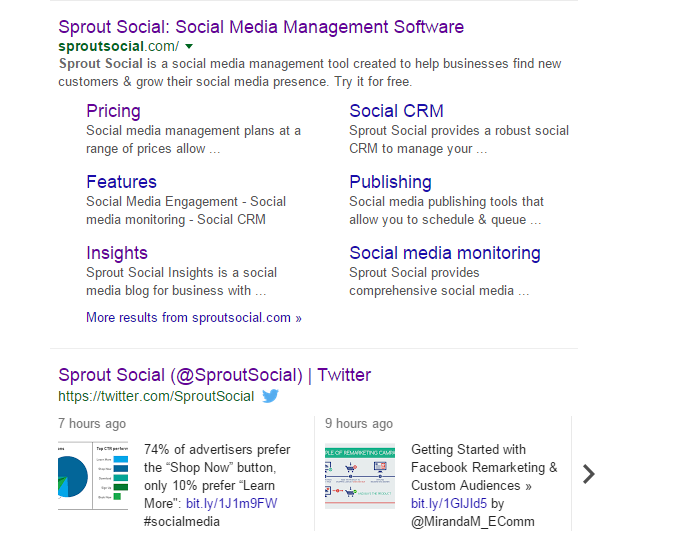 Take a look at the screenshot of the organic listings for Sprout Social – a social media management platform to businesses. As you’ll see, Twitter appears at the top of the organic rankings – immediately below the Sprout Social website. In the future content, social media and search will need to work in greater harmony than ever before. The screenshot above outlines the influence that one social media platform, Twitter, has on organic indexing. After all, social media channels are search engines, too. So what do you think? How much of an impact does social media have on your SEO efforts?